Toomey's rents a compact push mower with a 21" cutting deck. 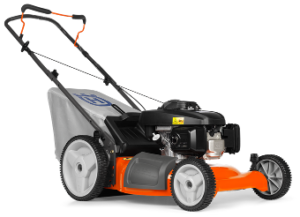 This mower features three cutting options (bag, mulch, or side shoot) and has a variety of different height settings. It's specifically meant for grass. For larger brush or weeds we also carry a larger Brush Mower. This lawn mower comes with a full tank of regular unleaded gas.